Despite regional volatility, the national average price for regular unleaded gasoline has remained relatively stable over the past 30 days. Today’s average price of $2.76 per gallon represents the lowest average for this date since 2010 and is down nearly a nickel per gallon compared to the 2015 peak price reached on June 15 ($2.80). National pump prices have slowly pulled back from this peak with averages down by one cent per gallon versus one week ago and four cents per gallon versus one month ago. 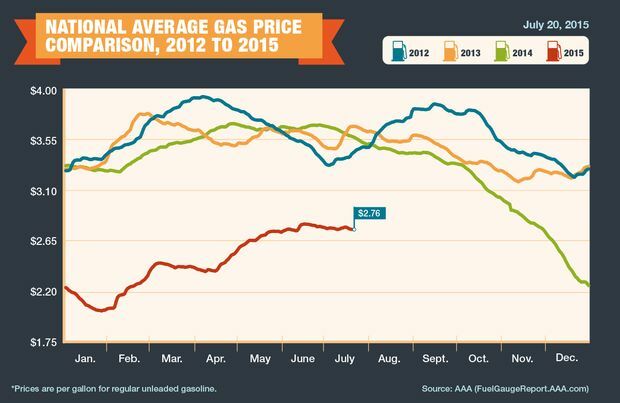 The national average is 82 cents per gallon less than a year ago. • Vermont’s current price is $2.73 per gallon, which is two cents lower than one week ago, and 99 cents lower than one year ago. • New Hampshire’s current price is $2.70 per gallon, which is one cent lower than one week ago and 93 cents lower than one year ago. • Maine’s current price is $2.76 per gallon, which is three cents lower than one week ago and 94 cents lower than one year ago. The relatively stable national average continues to disguise volatility in select markets. Drivers in California are paying the highest averages since August 2014, largely due to imbalances between gasoline supply and demand. A lack of imports and the blending components used to make CARBOB, the state’s mandated specialty fuel, are also reported to be dwindling and retail averages are expected to remain high. Ongoing refinery problems, particularly at the ExxonMobil facility in Torrance, also are playing a significant role in California’s gas prices. On the other end of the spectrum, averages in parts of the Great Lakes region are moving lower in dramatic fashion following the resolution of regional supply issues. California ($3.87) remains the nation’s most expensive market for retail gasoline, due supply difficulties. Bi-weekly price comparisons show pump prices that have spiked 44 cents per gallon, however prices have leveled off over the weekend and are down fractions of a penny since Friday. Regional neighbors Alaska ($3.47), Hawaii ($3.34), Nevada ($3.26) and Washington ($3.19) round out the top five most expensive markets for retail gasoline. Consumers in South Carolina ($2.37) and Alabama ($2.41) are paying the lowest prices at the pump – both discounted by nearly $1.50 per gallon compared to market leader California. This week’s trading session opened to news of falling oil rig counts in the U.S. and reports that Saudi Arabian oil exports fell to a five-month low this past May. Historically, either of these factors could have led to higher prices. However, neither factor has notably shifted market fundamentals today, as the lower rig count has been countered by reports that that U.S. production remains high and lower Saudi Arabian oil exports have been attributed to higher gasoline production in that country, rather than a decrease in oil production. Following the nuclear deal that was reached last week between Iran and China, France, Russia, the United Kingdom, the United States and Germany (the P5+1), the prospect for Iranian crude oil to return to the global market also remains top of mind for market watchers. Iran is home to the world’s fourth largest oil reserves and prior to sanctions was one of OPEC’s largest producers. Although the timeline for the possible return and at what quantity remains in question, downward pressure is expected to remain on global oil prices as a result of the news. At the close of Friday’s formal trading on the NYMEX, WTI tested the $50 per barrel mark and closed down two cents at $50.89 per barrel.